Another app that no one has any use for. Another app for which I cannot see anyone having a use. Ever. Maybe there is a social media component to this app that I did not explore. But it looks like it is only an avatar creation program. 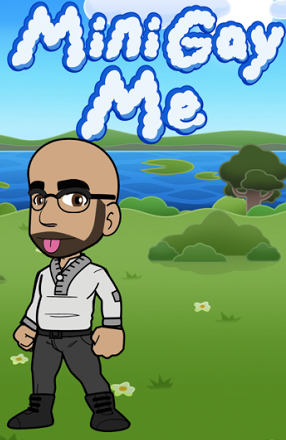 Anyhoo...it is the Mini Gay Me app. While it doesn't ask you to prove that you're a homo....it's safe to assume that mostly homos would use something like this. Case in point: me. And case in point: CB, as I snagged the idea from him after he posted his avatar on Facebook. I will say, his seemed to be closer to him than I got mine. The body type selections weren't plentiful. My boxer briefs are longer. The eyebrows and treasure trail might be dead-on accurate though. The lake? Totally fabricated! And if there is any validation that this is a mini-gay Blobby, I'll direct you to the disappointing selection of clothing and footwear styles. Don't even get me started on the limited selection of glasses! As if I'd ever wear that sweater! And you know, the sticking out of the tongue: well I could be doing that raspberry thing at all of you, or well......you know, Je Suis Blobby. Still, I don't quite get that this is anything new. Didn't Yahoo give you the ability to create your own avatar decades ago? I recall having one wearing a suit and tie. That's not even an option. Though I'm not sure Yahoo is much of an option these days either. I suppose I can use this as my FB profile picture.....but udder than that......I can't imagine me keeping it on my phone, taking up valuable storage space. Lovin those tight pants! Nice thighs there Blobby!